245x170mm. 3feps. Half title with advertisement on verso. Coloured Frontispiece. Title page in red and black text (with illustration of a beef forerib). 1+vi Translators preface. 1+viii-xii Preface. 1+xvi Illustrations. 1+xvl Contents. 1p List of coloured plates. 1p Part the first. 1+4-573. 1+576-599 Index. 3feps. Beautiful modern binding in half dark calf and corners with marbled boards. Spine with raised bands with elaborate gilt and blind tooling, a red and a green label with gilt lettering. Gilt edges to the text block. Externally and internally very clean. A handsome copy. - Jules Gouffe was born 1807 and died 1877. He felt himself to have a talent for cookery from his early youth. 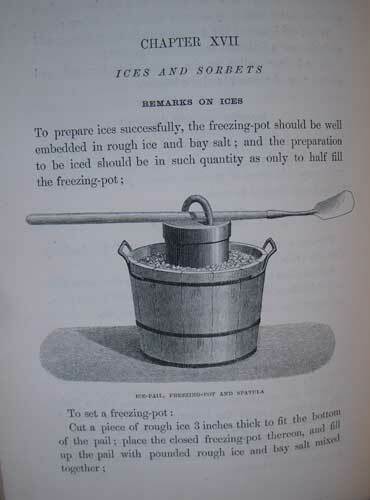 His father, an established pastry-cook in the Saint-Merri quarter, taught him the basic principles of cookery. 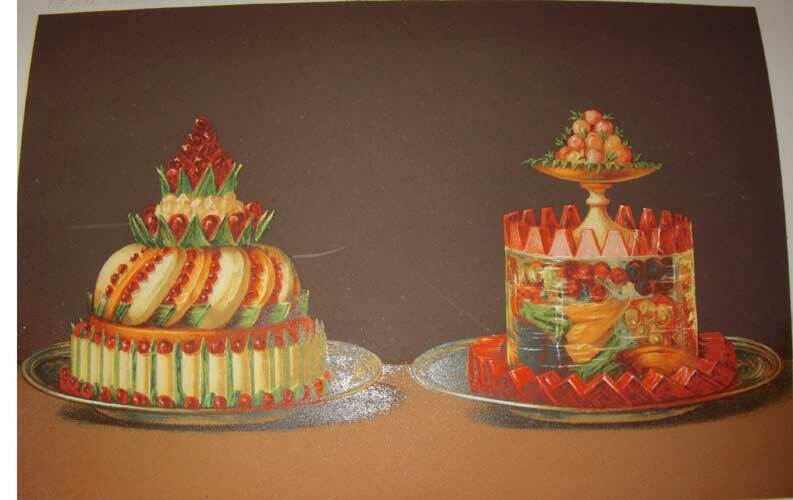 It was then that Antonin Careme, the great French Chef, hearing of the talent of the young Gouffe, who at seventeen was already showing promise in the decoration and presentation of set-pieces, took him into his kitchens at the Austrian Embassy in Paris. Careme turned him into a model carftsman, and a celebrity of his day. 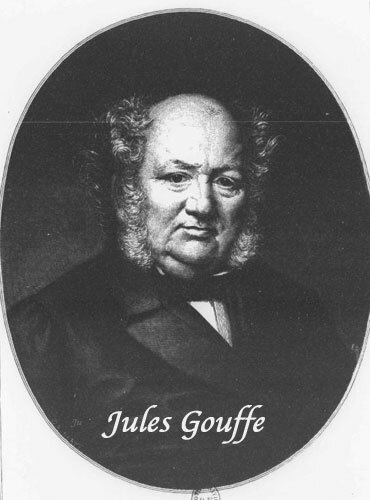 In 1840, Jules Gouffe set up on his own in the Faubourg Saint-Honore; his restaurant became one of the best in Paris. In 1855 he retired, but went back to work in 1867, encouraged by those famous gourmets, Dumas the elder and Baron Brisse. This pair of epicures offered him the post of Head Chef at the Jockey Club. 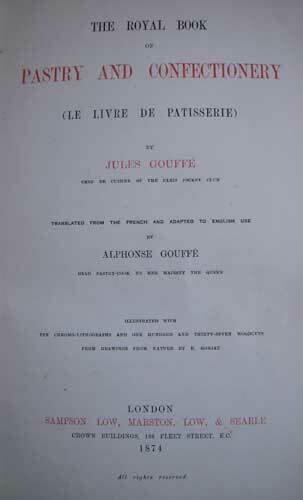 It was the time that Gouffe began to work on his 'Livre de Cuisine' (of which, 'The Royal Cookery Book' is the English translation) a magnificent book which deserves a place in every cookery book collection or library, side by side with Careme, Plumery, Urbain Dubois, Emile Bernard, Escoffier, et al. The pleasing way the book is set out, the very good professional recipes, the numerous woodcuts, the sixteen magnificent coloured chromo-lithographed plates delight lovers of good books in a way that perhaps other productions do not. FIRST AND SOLE EDITION. 224 X 146 mm. 3feps. 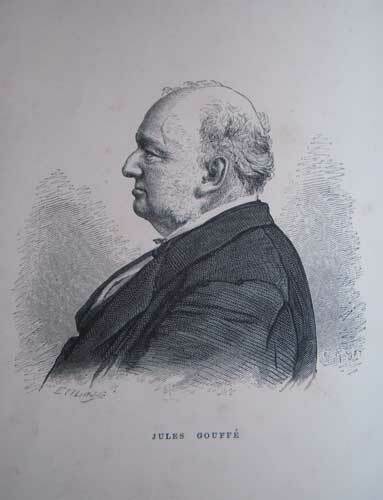 Frontispiece portrait of Jules Gouffe. Title page. 1+vi Preface. 1+vii Contents. 1+2-322. 1+324-333. Index to Woodcuts. 3feps. Beautiful modern binding in half dark calf and corners with marbled boards. Spine with raised bands with elaborate gilt and blind tooling, a red and a green label with gilt lettering. Gilt edges to the text block. Externally and internally very clean. A wonderfully handsome copy. - This book is very scarce and uncommon. Originally published in French under the title 'Le Livre des Conserves' Paris. 1869. 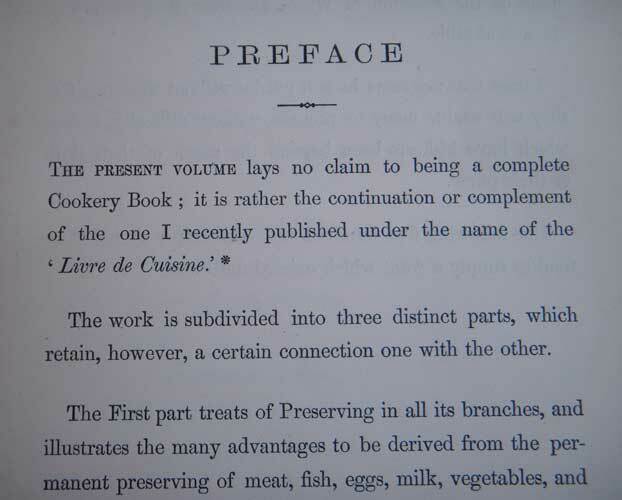 Gouffe states in the preface that "The present volume lays no claim to being a complete Cookery book: it is rather the continuation or complement of the one I recently published under the name of the 'Livre de Cuisine' Paris. 1867." 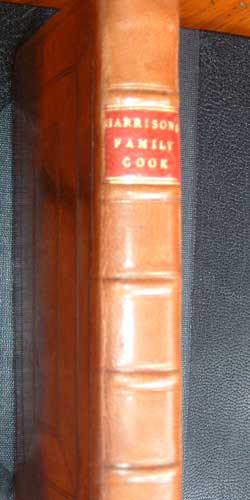 (The Royal Cookery Book. 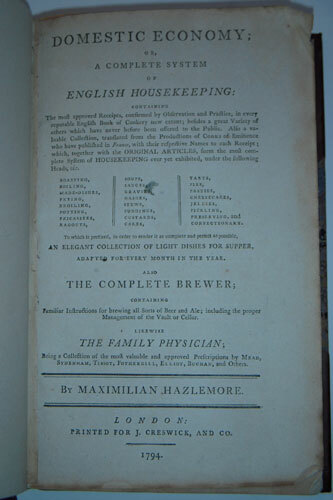 First edition in English published London. 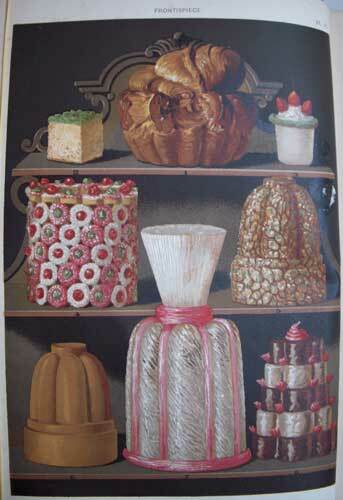 1871) Gouffe also published another complimentary book, titled 'The Royal Book of Pastry and Confectionary' London. 1874. This book has some nice woodcut illustrations throughout the text but none of the wonderful coloured chromo-lithograph plates of the other two books. Contrary to Gouffe's own admission it appears quite complete. FIRST AND SOLE EDITION. 240 X 168mm. 4feps. Half title. [1+1] Coloured frontispiece. Title page in red and black text. 1+vi-xii. 1+xiv Contents. 1+2-453. 1+456-471 Index. 1+474 Index of 127 woodcuts. 2p Advertisements. 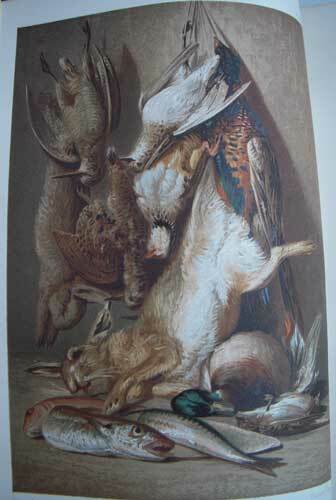 with 10 chromo-lithograph coloured plates. 3feps. Very nice modern quarter dark brown calf with calf corners and marbled boards. Spine with raised bands and elaborate gilt and blind tooling. A red and a green label with gilt lettering. Externally and internally very bright and clean. A handsome copy. 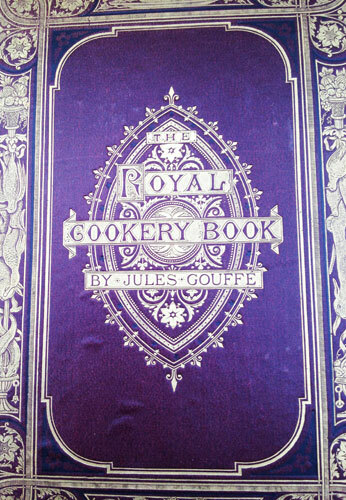 - Translated from the French by Jules's brother Alphonse, Jules Gouffe's 'Royal Book of Pastry' is quite rare. 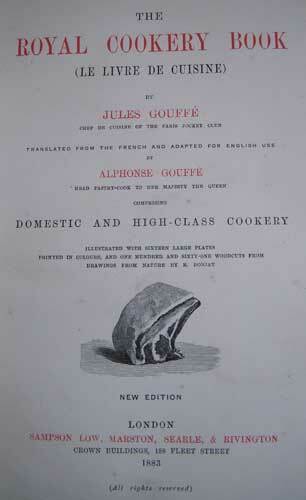 Axford does not even have an entry for Gouffe, while Oxford, Cagle and Bitting do not have a copy, although Bitting records the first French edition of 1873. 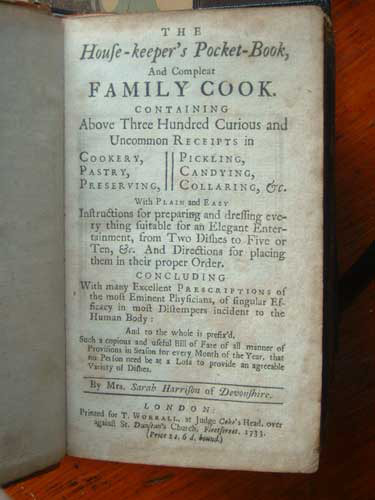 This book was written to accompany the more common 'Royal Book of Cookery'. It is also just as handsome and well produced. Gouffe. Jules - Rare first edition in beautiful original binding. FIRST ENGLISH EDITION. 245x170mm. 2feps. Half title with advertisement on verso. 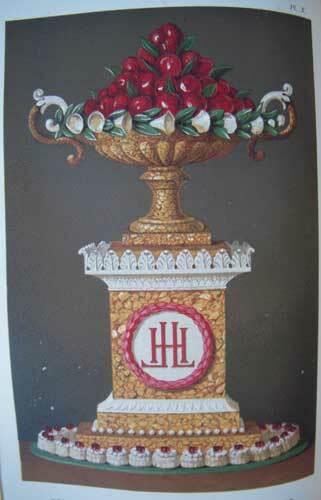 Coloured Frontispiece with tissue guard. 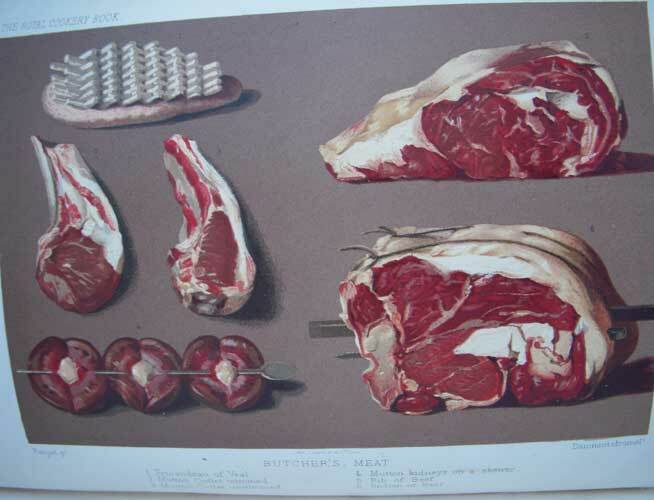 Title page in red and black text (with illustration of a beef forerib). 1+vi Translators preface. (1)viii-xiii Preface. (1)xvi Illustrations. (1)xviii Contents. 1p Part the First. (1)4-671. (1)674-677 Appendix. (1)680-700 Index. (1)702 Index to Woodcuts. (1) Index to Cloured Plates. 1fep. With the full original dark burgundy cloth binding and the elaborate gilt tolling on the spine and front boards. The spine has been expertly re-laid and strengthened and the gilt tooling is nice and bright all over. All edges gilt. Text block is tight and very clean. A fantastic copy in the original state. 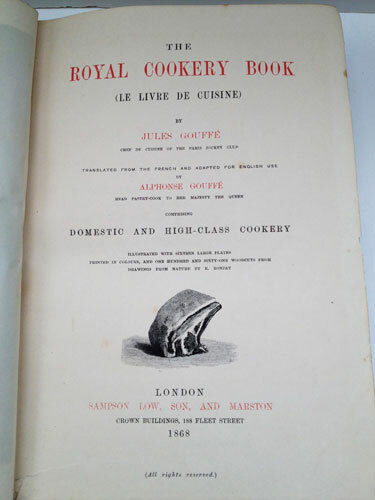 - Jules Gouffe wrote very eloquently - "Having, from my earliest youth, embarked upon a career of cookery, I saw much, observed much, practised much in every sense of the word. 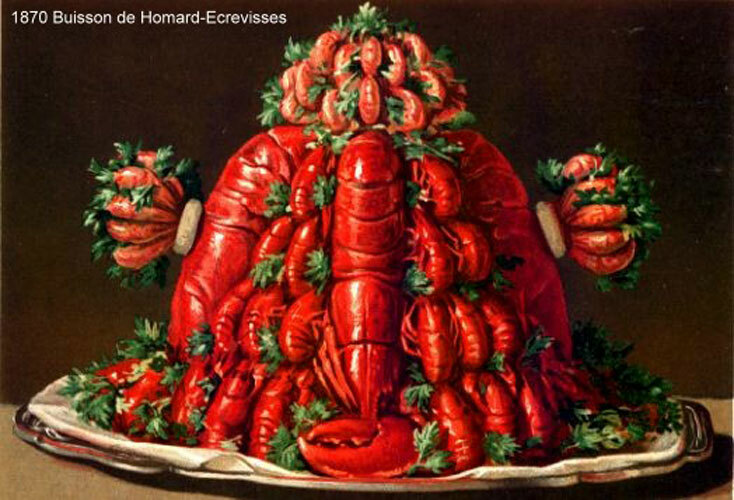 I am not one of those who declare that French cookery, that part of our national heritage of which we have reason to be proud, is lost today and that it will never recover. The good and true things never die. No doubt there may be periods of decline, but sooner or later, with hard work, intelligence and good will, there must be a recovery. If, thanks to the reforms and the methods which I propose, I find that in a few years' time everyone, whatever his rank in society, is eating as well as he possibly can. On the one hand, household cookery is at last being carried on with care, economy and comfort; on the other hand, the ‘grande cuisine' goes forward under progressive conditions, and with that good taste and brilliance which is so appropriate to a century of enlightenment and luxury like our own; then I shall have truly attained the goal which I have set myself, I shall feel myself well paid for all my pains.” Gouffe wrote four major works in French. They have all have been translated into English by Alphonse Gouffé, his brother who was also the Head Pastry Chef of Queen Victoria. 1. 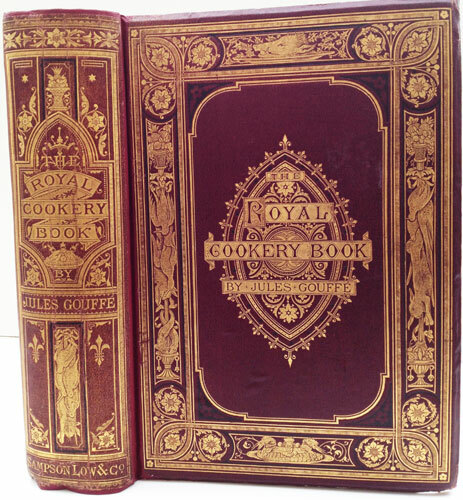 Le livre de cuisine – the ‘The Royal Cookery Book’ in English it was rated as one of the finest cookbooks ever written. 2. 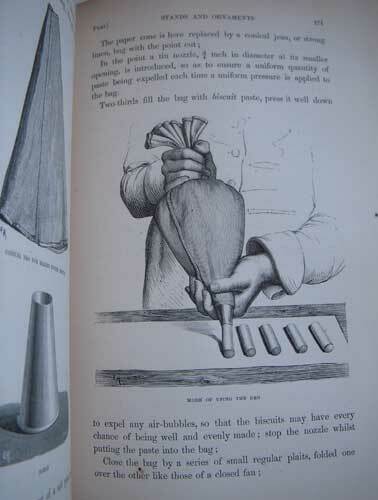 Le livre de patisserie- The Royal Book of Pastry and Confectionery highlighting the methods of creating ‘pièces montées’ was published in 1873 by Librairie Hachette. 3. 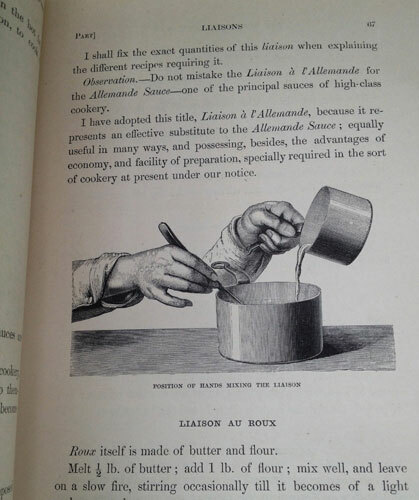 Le livre des conserves- The Book of Preserves by Jules Gouffe was also published in 1873. 4. 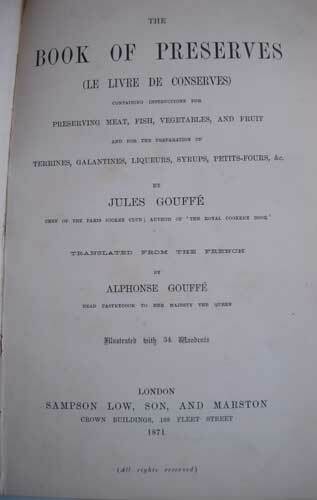 Le livre des soupes et des potages- This book by Gouffe contained more than 400 soup recipes. He died at Neuilly in 1877. 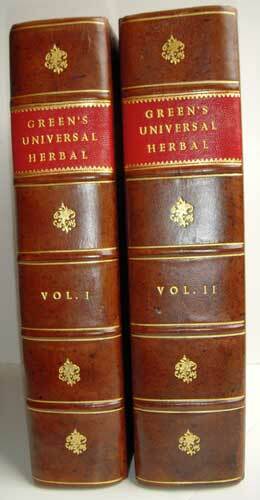 Green Thomas - 2 volumes - 1824. 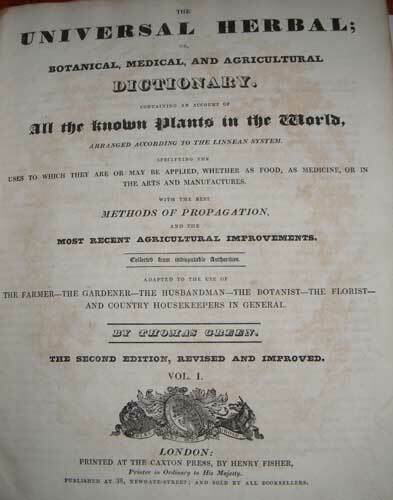 VOLUME 1: OR, BOTANICAL, MEDICAL, AND AGRICULTURAL DICTIONARY. CONTAINING AN ACCOUNT OF all the known Plants in the World, ARRANGED ACCORDING TO THE LINNEAN SYSTEM. SPECIFYING THE USES TO WHICH THEY ARE OR MAY BE APPLIED, WHETHER AS FOOD, AS MEDICINE, OR IN THE ARTS AND MANUFACTURES. WITH THE BEST METHODS OF PROPAGATION, AND THE MOST RECENT AGRICULTURAL IMPROVEMENTS. Collected form indisputable Authorities. ADAPTED TO THE USE OF THE FARMER - THE GARDENER - THE HUSBANDMAN - THE BOTANIST - THE FLORIST - AND COUNTRY HOUSEKEEPERS IN GENERAL.. BY THOMAS GREEN. THE SECOND EDITION, REVISED AND IMPROVED. VOL.1. (Printers device) LONDON: PRINTED AT THE CAXTON PRESS, BY HENRY FISHER, Printer in Ordinary to His Majesty. PUBLISHED AT 38, NEWGATE-STREET; AND SOLD BY ALL BOOKSELLERS. VOLUME 2: THE UNIVERSAL HERBAL; OR, BOTANICAL, MEDICAL, AND AGRICULTURAL DICTIONARY. CONTAINING AN ACCOUNT OF all the known Plants in the World, ARRANGED ACCORDING TO THE LINNEAN SYSTEM. SPECIFYING THE USES TO WHICH THEY ARE OR MAY BE APPLIED, WHETHER AS FOOD, AS MEDICINE, OR IN THE ARTS AND MANUFACTURES. WITH THE BEST METHODS OF PROPAGATION, AND THE MOST RECENT AGRICULTURAL IMPROVEMENTS. Collected form indisputable Authorities. ADAPTED TO THE USE OF THE FARMER - THE GARDENER - THE HUSBANDMAN - THE BOTANIST - THE FLORIST - AND COUNTRY HOUSEKEEPERS IN GENERAL.. BY THOMAS GREEN. THE SECOND EDITION, REVISED AND IMPROVED. VOL.11. (Printers device) LONDON: PRINTED AT THE CAXTON PRESS, BY HENRY FISHER, Printer in Ordinary to His Majesty. PUBLISHED AT 38, NEWGATE-STREET; AND SOLD BY ALL BOOKSELLERS. Large thick 4to. 2x275x220mm. VOLUME 1: 2feps. Hand-coloured allegorical frontispiece of Wisdom and Activity collecting Vegetables. An engraved allegorical hand-coloured vignette title. Title Page. 2p Preface. (1)2-10 Introduction. 1 hand-coloured plate of simple leaves. 11-790. 3 feps. VOLUME 2: 3feps. Hand-coloured allegorical frontispiece of Elements producing Plants & Flowers. Title Page. (1)4-883. (1)2-56 Apendix. 4feps. 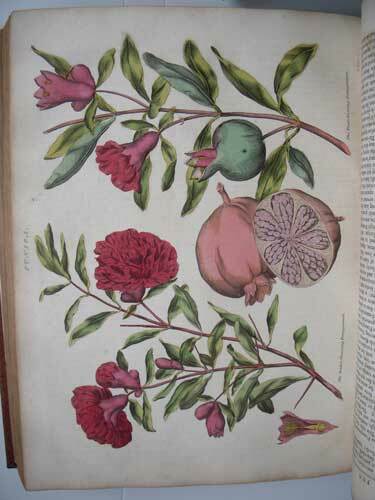 Both volumes hold a total of 109 -- 3 frontispieces and 106 very finely coloured botanical plates. Each plate is dated, also with the Latin name from the Linnean System and common English name given for each plant. Both volumes finely and fully bound in modern dark tan calf with blind tooling on the edge of the boards. 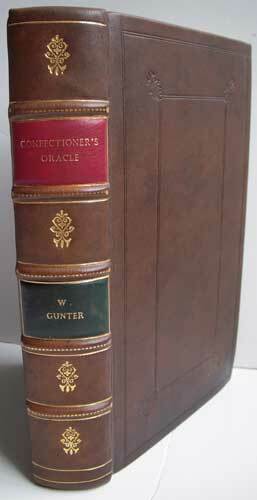 The spines have raised bands with gilt lines and devices in the compartments. Each has a dark red morocco label with gilt lettering. Internally very clean. A very handsome set. 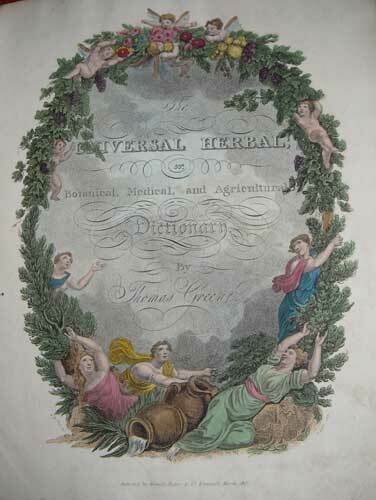 - Thomas Green was a British author who published this massive herbal dictionary in 1816. Little is known about him, but he may be the same Thomas Green who wrote Extracts from the Diary of a Lover of Literature (1810), Memoirs of her Late Royal Highness Charlotte Augusta (1818) and A Biographical Memoir of the Late Edward Pearson DD (1819). These books on show here are illustrated with three fine allegorical frontispieces by William Marshall Craig and stipple-engraved (a method of engraving in which a grainy effect is produced by a series of tiny dots or flecks) by R. Hicks. Craig was a fashionable miniature painter who illustrated London Cries (1804) and exhibited at the Royal Academy from 1788 to 1827. The 106 botanical plates were engraved by F. Dixon, G. Dobie, W. Swift and others. Most of the plates depict two or four plants, and many were copied from originals by famous botanical artists such as Merian, Ehret and Miller. 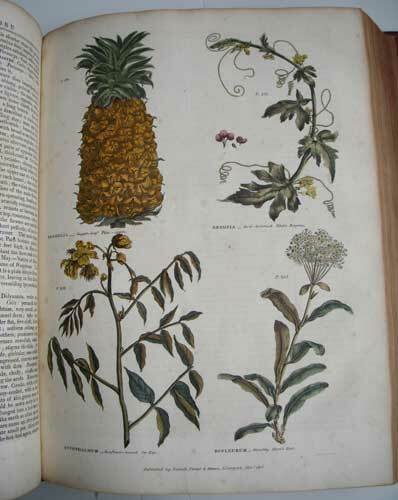 The pineapple, melon, lemon and pepper were copied from Maria Sybilla Merian's Metamorphosis Insectorum Surinamensium (1705); the orchid, carnation, papaya, etc., were copied from Philip Miller's Gardener's Dictionary (1755). This handsome book 'The Universal Herbal' is an encyclopedia of herbal knowledge, augmented with gardening and cooking information, this popular book was re-issued in this second edition revised format in 1824 at the Caxton Press, London, and Henry Fisher, Liverpool. The BL has 4 copies. Surprisingly three are odd variants -- an 1820 and a n/d, both printed in Liverpool. One of 1923 has no place of printing, also one dated 1924. The BL does not have a first of 1816. CONTAINING RECEIPTS FOR DESSERTS ON THE MOST ECONOMICAL PLAN FOR PRIVATE FAMILIES, AND ALL FOUNDED ON THE ACTUAL EXPERIMENTS OF THIRTY YEARS. WITH AN APPENDIX, CONTAINING THE BEST RECEIPTS FOR PASTRY-COOKS, AND AN ELUCIDATION OF THE PRINCIPLES OF GOOD CHEER. BEING A COMPANION TO DR. KITCHINERS COOK'S ORACLE. BY W. GUNTER. Palmam qui meruit ferat. LONDON: ALFRED MILLER, 137, OXFORD STREET. 1830. FIRST & SOLE EDITION. 12mo. fep. 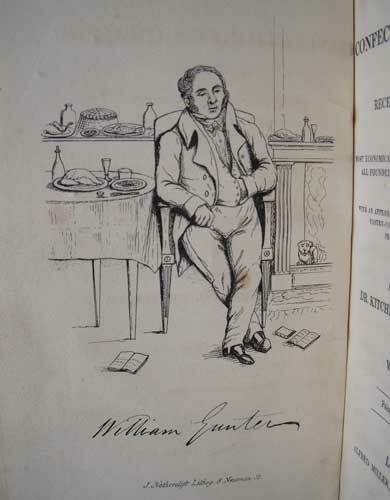 Frontispiece of Gunter. Title Page. III-VI PREFACE. VII-XXXII INTRODUCTION. 4p. Engraved Table settings, 1 folding. 1-238. fep. Fully bound in modern mid-brown calf with blind tooling on boards. Spine with gilt fleur-di-lis, gilt lines and gilt dots. Also with red and green labels, gilt lettering and raised bands. Internally very clean. An extremely nice copy. Not in Bitting nor Oxford. 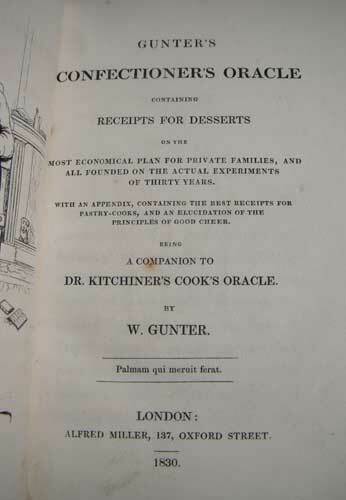 - In the Introduction, the Author states -- I remember when I last dined with that eccentric but amiable and intelligent man, the late Doctor Kitchiner, in Warren-street, he said to me as the dessert made its appearance, "Gunter, you ought to write a book on Confectionery as a companion to mine on the Art of Cooking. You would have an advantage over me, in as much as you are professionally famed, and your Work would be popular, for it is of as vital importance in perfecting the jouissances of life, as my own" A very interesting book. Unusual, in that it has a long Appendix, running from page 123-238. The Gunter family came into ownership of the famous Negri Confectioner's shop in Berkley Square, London and at one point employed Guglielmo Jarrin, the author of the wonderful book, 'The Italian Confectioner'. The shop continued to trade well into the twentieth century. OR,Expert and ready Way for the Dressing of all Sorts of Flesh, Fish: Either Bak'd, Boil'd, Roasted, Stew'd, Fry'd, Broil'd, Hash'd, Frigasied, Carbonaded, Forc'd, Collard'd, Sous'd, Dry'd, etc. After the Best and Newest Way. With their several Sauces and Salads. And making all sorts of PICKELS. ALSO Making Variety of Pies Pasties, Tarts, Chees-Cakes, Custards, and Creams, etc. WITH The ART of Preserving and Candying of Fruits and Flowers; and making of Conserves, syrups, Jellies, and Cordial Waters. Also making several sorts of English Wines, Cyder, Mead, Metheglin. TOGETHER, With several Cosmetick or Beautifying Waters: And also several sorts of Essences and Sweet Waters, by Persons of the highest Quality. By T. Hall, Free Cook of London. The Second Edition. Lonodn: Printed for C. Bates, at the Sun and Bible in Gilt-spur-street, in Pye-corner: And A. Bettesworth, at the Red Lion on London-Bridge, 1713. Licenses according to Order. 12 mo. Woodcut frontispiece with the head of Queen Anne above three sections. On the recto of the Frontis there is a manuscript note in ink -- ' Elizabeth Lidlow her book 1796 Given by her Grandfather' Title page. 5-6. The Preface. 7-180. 2 feps. 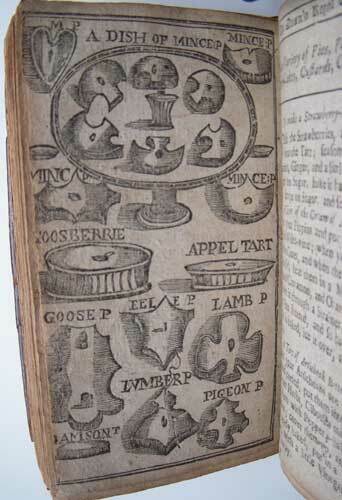 A full page woodcut of pies on p.133. The whole text lightly age browned throughout. Contemporary full dark brown calf boards neatly relaid, with a nice patina. 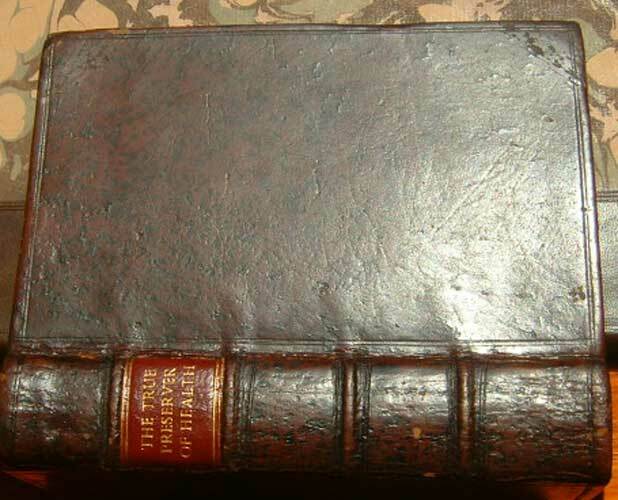 The spine is modern dark brown calf with raised bands and gilt lettering. A very scarce book. - This second edition is very scarce with only a handful of copies located in the US; at Cornell, Kansas State, the Lib. Of Congress and a private owner. In UK there are three recorded; one each in the BL, Cambridge and the Wellcome Institute. Cagle was not able to locate a first and Bitting’s copy is 1730. There were six editions up to 1734. 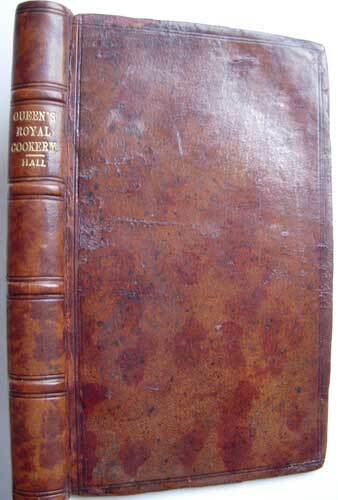 The Queen's Royal Cookery, by T. Hall, was first published in 1709 (with the BL also holding one of only three known). 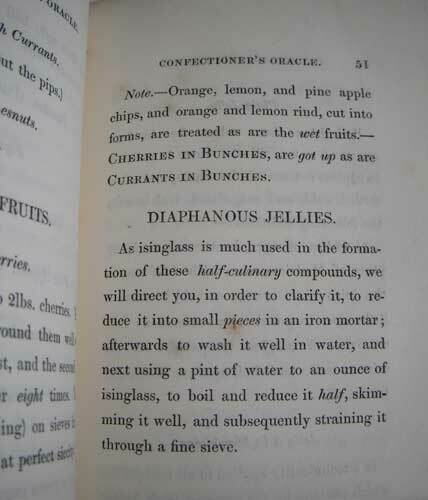 As well as a wide variety of basic culinary recipes, the book contains instructions for preserves, candies, cosmetics and beautifying waters. 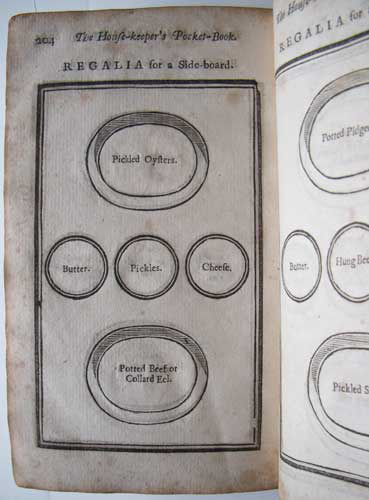 It is one of a number of books claiming to reveal the secrets of the royal kitchens, a highly fashionable subject during the 17th and 18th centuries. Queen Anne, who reigned from 1702-1714, was a rich source of gossip, and the public seemed to have an endless fascination for any information gleaned from beyond the palace walls. The production of art and literature prospered during Her reign. 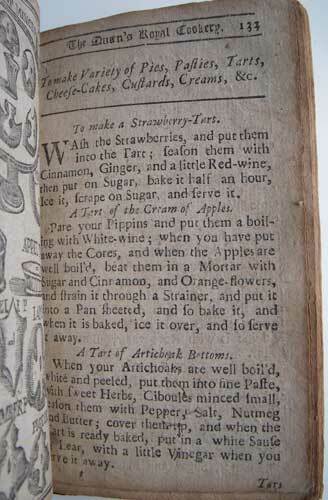 Throughout this period booksellers churned out popular recipe books, fully aware of the commercial viability of recipes linked to prestigious chefs. Unfortunately many of the books were thrown together by money-making charlatans who had simply filched their material from existing publications. 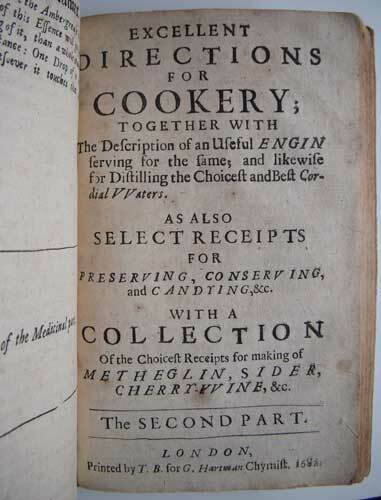 Forty of T. Hall's recipes were taken directly from 'The Closet of the Eminently Learned Sir Kenelm Digby' (1669). 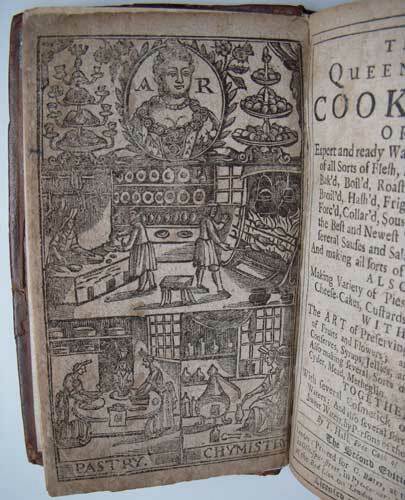 Never the less an interesting book with the 17th century styled frontis of three engraved sections; A woodcut portrait of Queen Anne over a working kitchen scene, a pastry kitchen scene and a chymistry (chemistry) scene, which actually looks like a small distillery. 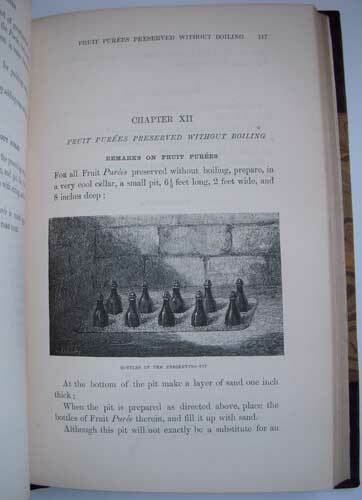 Mrs Pennel - p145, describes Hall as a Free Cook of London, with little else known about him. Oxford p52, Cagle p719, Maclean p65. FIRST EDITION. 12mo. Pp. Title Page. (v-xii) (2-217) 20 pp of engraved Table Settings. 13 pp of Contents. Contemporary dark brown calf boards with blind tooling, nicely polished. Relaid tan calf spine with raised bands and red label with gilt lettering. Pages lightly browned throughout. A good copy. - MacLean states on pp.66, of this first edition of 1733 - "no copy located in the British Isles". The B.L. Integrated Cat. cites one incomplete copy of the 1733 edition. Considering MacLean's bibliography was printed as recently as 1981, her research leaves question marks. Nevertheless an extremely rare book. Hartman. George - Sir Kenelm Digby's former Steward. BEING A CHOICE COLLECTION OF Select and Experienced REMEDIES for all Distempers incident to Men, Women, and Children. Selected from, and Experienced by the most Faamous Physicians and Chyrurgions of Europe. 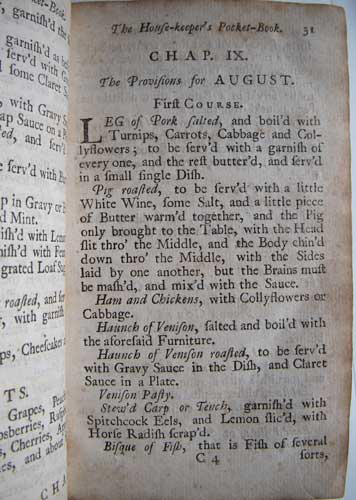 TOGETHER WITH Excellent DIRECTIONS for COOKERY; AS ALSO FOR PRESERVING, and CONSERVING, and making all sorts of METHEGLIN, SIDER, CHERRY-WINE, &c. WITH THE Description of an Ingenious and Useful ENGIN for Dressing of Meat, and for Distilling the Choicest Cordial Waters without Wood, Coals, Candle, or Oyl. THE SECOND EDITION WITH ADDITIONS. 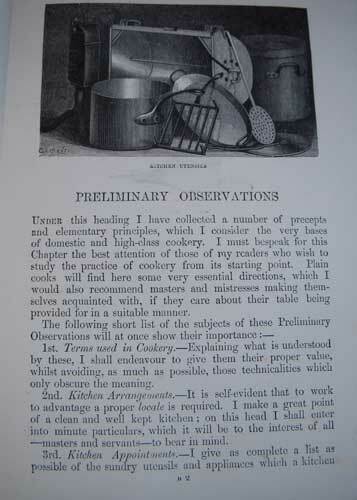 Published for the Publick-Good by G. Hartman, Chymist. London: Printed for A. and F. Churchill, at the Black-Swan in Pater-Noster-Row. 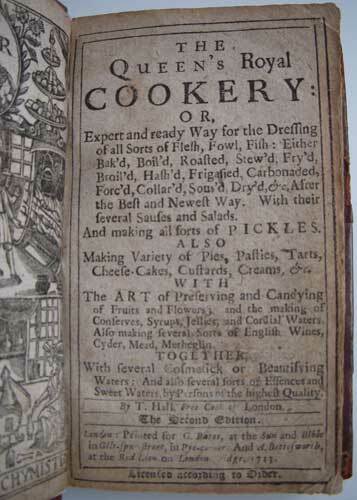 1695.- Bound With: EXCELLENT DIRECTIONS FOR COOKERY; TOGETHER WITH The Description of an Useful ENGIN serving for the fame; and likewise for Distilling the Choicest and Best Cordial Waters AS ALSO SELECT RECEIPTS FOR PRESERVING, CONSERVING, and CANDYING,&c. WITH A COLLECTION Of the Choicest Receipts for making of METHEGLIN, SIDER, CHERRY-WINE,&c. THE SECOND PART. LONDON, Printed by T.B. for G. Hartman Chymist. 1682. FIRST EDITION. 12mo. Pp. Title Page. 6pp Epistle. 7pp Index. 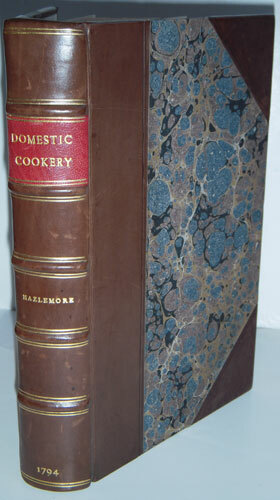 (1-352) Fully Bound in dark brown calf with original boards and blind tooled borders. Original Spine with raised bands and red label with gilt lettering.-2ND PART; Pp. Title Page. (3-80) Engraved picture of 'Distillery Engine' 32 pp 'Select Receipts' Internally very clean with minimal aging to pages, with some pages a little more brown due to paper quality. Title page has a small brown stain that does not affect overall. An extremely scarce book. - George Hartman was the steward and assistant to Sir Kenelme Digby. 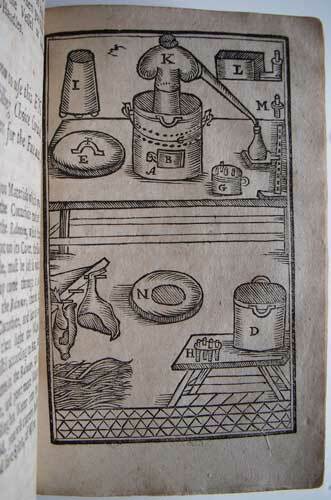 He published in 1669, from a compilation of Digby's notes, 'The Closet of the Eminently Learned Sir Kenelme Digby KT. 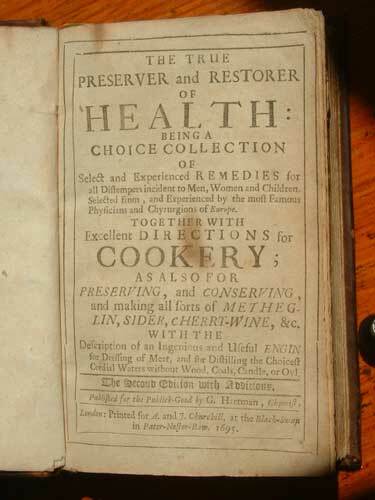 Opened' One of the most important cookery books of the seventeenth century and considered an excellent source of period recipes, particularly for beverages such as mead. Sir Kenelme Digby died on June 11, 1665. Hartman then published the first edition of this work 'The True Preserver' in 1682. Hazlemore. Maximilian Rare to extremely rare. 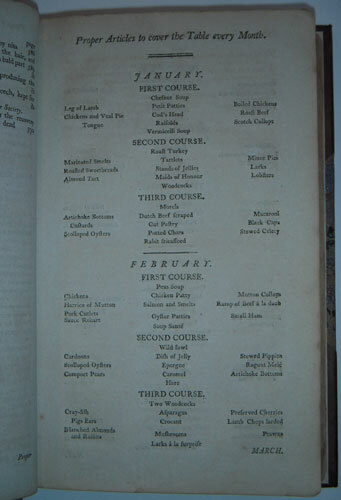 OR A COMPLETE SYSTEM OF ENGLISH HOUSEKEEPING CONTAINING The most approved Receipts, confirmed by Observation and Practice, in every reputable Book of English Cookery now extant; besides a great Variety of others which have never before been offered to the Public. 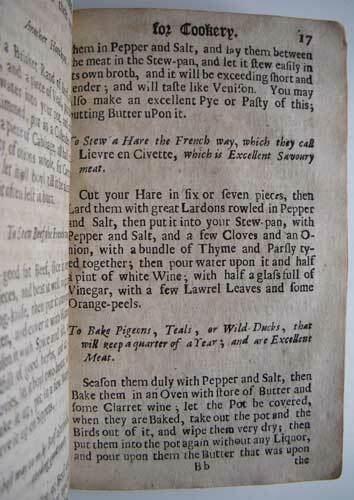 Also a va-luable Collection, translated from Productions of Cooks of Eminence who have published in France, with their respective Names to each Receipt; which, together with the ORIGINAL ARTICLES, form th emost com-plete System of HOUSEKEEPING ever yet exhibited, under the following Heads, viz. 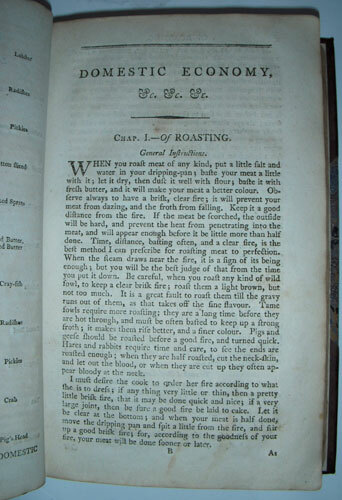 ROASTING, BOILING, MADE-DISHES, FRYING, BROILING, FRICASSES, ROGOUTS, SOUPS, SAUCES, GRAVIES, HASHES, STEWS, PUDDINGS, CUSTARDS, CAKES, TARTS, PIES, PASTIES, CHEESECAKES, JELLIES, PICKLING, PRESERVING, and, CONFECTIONARY. 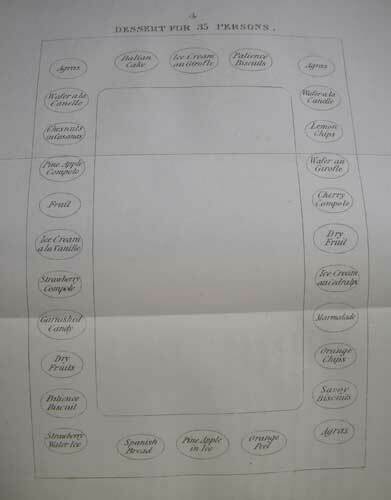 To which is prefixed, in order to render it as complete and perfect as possible, AN ELEGANT COLLECTION OF LIGHT DISHES FOR SUPPER,ADAPTED FOR EVERY MONTH OF THE YEAR. ALSO THE COMPLETE BREWER; CONTAINING Familiar Instructions for brewing all Sorts of Beer and Ale; including the proper Management of the Vault and Cellar. LIKEWISE THE FAMILY PHYSICIAN; Being a Collection of the most valuable and approved Prescriptions by Mead, Sydenham, Tissot, Fothergill, Elliot, Buchan, and Others. BY MAXIMILIAN HAZLEMORE. LONDON: PRINTED FOR J.CRESWICK, AND CO. 1794. FIRST AND SOLE EDITION. 8vo. 1fep. Title page. (1)+4 To the Public. (1)vi-xxiz Contents. (1)xxvi-xxxii Proper Articles to cover the Table every Month. (1)2-392. 2feps. Modern dark brown calf, with marbled boards and calf tips. Spine with raised bands gilt lines with a red label and gilt writing. Externally very good, internally age-browned throughout. Overall a nice copy of a extremely scarce book that rarely appears on the market. - Nothing seems to be known about Hazlemore. Cagle proclaims p530.- 'This is a word for word reprint of Mary Cole's 'Lady's Complete Guide, or Cookery in all its Branches' London 1791. Oxford states on p122 exactly the same thing and wonders who the author may be. Not having a copy of Cole handy at this time, I cannot make any kind of real or true comparison. I am struck however, by the very unusual and honest habit of Hazlemore's, to attribute and note the names of previously published authors he used, against each of his receipts.